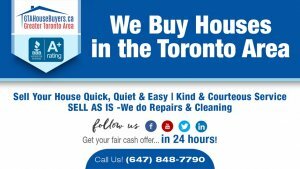 If you own a house in Toronto and want to sell it quickly, read this blog for 5 tips that will help you sell your house sooner! One of the most time-consuming reasons that homes don’t get sold as quickly as the seller wants to sell is because of the renovations, repairs, and clean-up that needs to happen before the home can go on the market. Real estate agents understand what their buyers are looking for, so they usually urge sellers to make renovations. Unfortunately, the larger the renovation, the longer the sale is delayed. In a slow market there is often many other beautifully renovated houses for buyers to choose from. If your house isn’t renovated, then many buyers may not even look at it. When a home is sold “on the market” (usually listed by an agent), the prospective buyers are usually called “retail buyers,” meaning that the buyers are looking to buy a home that they want to live in. Unfortunately, retail buyers are notoriously unpredictable and they buy on their own timeline, which may not be your timeline! A better option is to think about selling to a professional house-buying company. How to sell a house fast in a slow market? Contact GTA House Buyers today!